The title ‘comic nerd’ has always escaped me. They are cool, they are nifty, and their storylines are quite often entertaining with the added bonus of some truly interesting artwork. Yet something has always kept me from diving into the pool of comics, and I’m not sure what that is since I enjoy reading them. Calebros, was no different. It was a delight from beginning to end and reminded me why Clan Nosferatu always ranked high on my list of favorites. Calebros is part of a series of comics that were produced several years ago that followed the so the uninitiated reader should be warned that jumping into the story arc with this work will leave one rather confused. One the few flaws I caught was the lack of an introduction. Some background information for the new reader would have been greatly appreciated and it would also have helped spark my own memory in regards to White Wolf’s now dormant story arc. The comic follows the endeavors of a recently promoted Nosferatu elder to the rank of Prince. Previously, and not shown, Calebros had spearheaded the effort to retake the city of New York from the Sabbat. For his show of intellectual might, he was awarded the city as its ruler. The fact that no one else wanted the position was mentioned on a regular basis. As influential as Calebros was in the past with planning the over all offense against the Sabbat, he is a perfect study on how utterly wrong an individual can be for the role as Prince. His grip on his mental equilibrium slips inch by inch as his problems mount. Chief among those trials are Sabbat attacks and the possibility of a Niktuku skulking about the sewers. While the Sabbat attacks are on the rise, they also show evidence of inside information. Counter attacks fail, serious breaches occur with devastating effects, and secrets are passed on. Each victory reveals a deep rift within the ranks of the Nosferatu which only adds to Calebros’ issues with reality. As the rift widens, Calebros suffers even more setbacks with his fragile sanity. However, he does persevere and slowly reigns in the chaos which gains him the full support of the Nosferatu once again. Calebros, or a similar character, would make an interesting addition to most Vampire campaigns. He means well and he is highly intelligent, yet that just makes him all the more tragic. He is Nosferatu and his social abilities border precariously on non-existent. In the middle of the multitude of chaos around him, he even introduces two extremely kindred whose friendship could easily complicate things further down the line. That could simply be attributed to inexperience, but Calebros seemed to believe it was simply a good joke to pull on the pair of them. 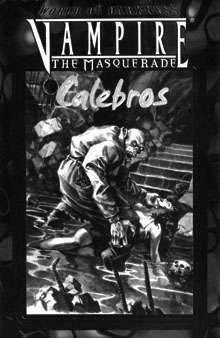 The comic Calebros was a wonderful look back on the old World of Darkness I had loved and played for so many years. Novices would do well to read the series of comics, of which Calebros is but a small part, for insights on how various clans interact and how they move around socially with one another. Long time players would enjoy the memories Calebros and the other comics might bring up, having played Vampire since.. 1992? (gads.. I’m getting old) I know it awakened my love of the game that I thought was long dormant.